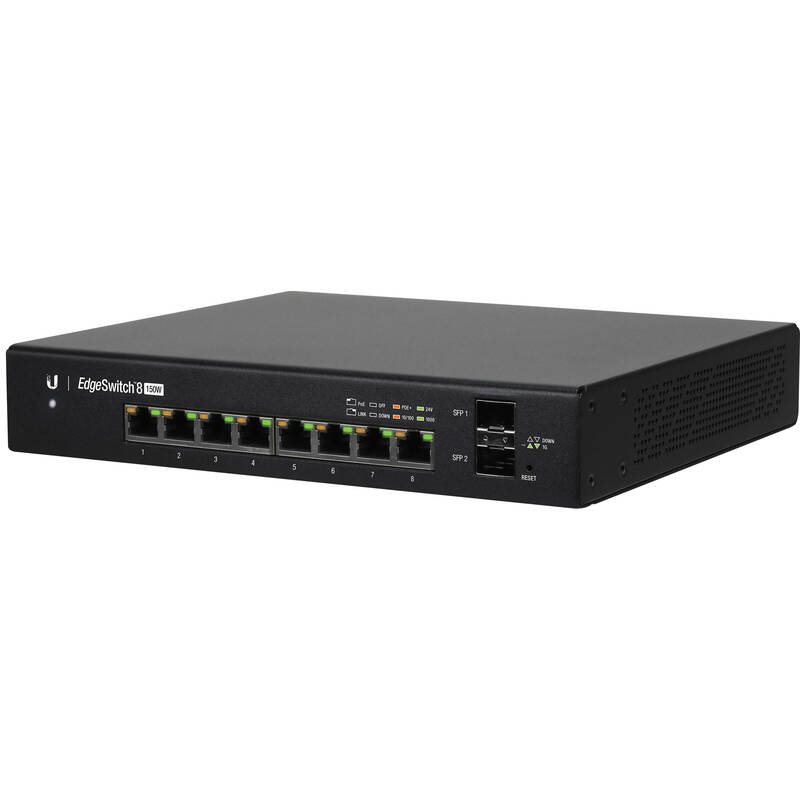 With a comprehensive user interface and support for fiber connectivity the EdgeSwitch 8-Port 150-Watt Managed PoE+ Gigabit Switch with SFP from Ubiquiti Networks is a full featured networking solution. Along with the two 1 Gbps SFP Ethernet ports, you can take advantage of 8 Gigabit Ethernet ports supporting a max power over Ethernet wattage of 34.2 watts per port. The voltage ranges from 50 to 57 volts with a maximum passive power over Ethernet wattage per port of 17 watts. Other networking features include VLAN, private VLAN, voice VLAN, link aggregation, DHCP snooping, IGMP snooping, and much more. The unit comes with rack mount brackets. The EdgeSwitch offers the forwarding capacity to simultaneously process traffic on all ports at line rate without any packet loss. For its total, non-blocking throughput, the 8-port models support up to 10 Gbps. This EdgeSwitch PoE Gigabit Ethernet switch offers 8 ports of auto-sensing IEEE 802.3af/at and configurable 24V Passive PoE to simplify your infrastructure. By default, the EdgeSwitch automatically detects 802.3af/at devices so they automatically receive PoE. For 24V Passive PoE devices, manually enable 24V passive PoE using the EdgeSwitch Configuration Interface. The EdgeSwitch provides fiber connectivity options for your growing networks. This 8-port model includes two SFP ports, providing up to 1 Gbps uplinks. Box Dimensions (LxWxH) 13.4 x 9.35 x 2.85"
EdgeSwitch 8-Port 150-Watt Managed PoE+ Gigabit Switch with SFP is rated 4.7 out of 5 by 3. Rated 4 out of 5 by Tom from ES-8-150W I needed a small managed POE switch with 8 ports, the SFP ports are just icing on the cake. I prefer the EdgeSwitch over the UniFi Switch. The Unifi controller view is OK but I like switches I can connect to directly for configuration. This is just first of several EdgeSwitches I expect to purchase (the rest will be the larger versions).